You are here: Home / Skincare / UV Index App By Coppertone! 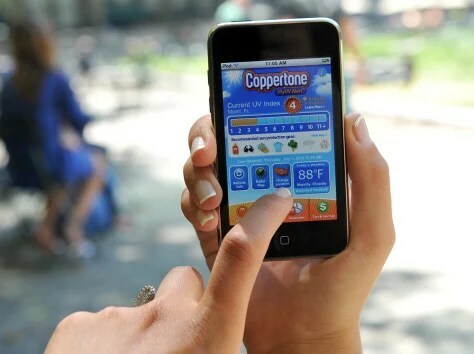 UV Index App By Coppertone! Diane Bondareff / AP Coppertone’s newly released “MyUV Alert” iPhone mobile app can be used to to look up a local UV index forecast. The free service also provides customizable sunscreen reapplication reminders and personalized suncare recommendations. When parents have to worry about sun protection, it’s no day at the beach. COPPERTONE® MyUVAlert™ to the rescue! This handy application helps you with sun protection information for your whole family, offering local UV index forecasts, custom sunscreen reapplication reminders that you set, individualized product recommendations, coupons, sun protection tips and more. • Custom reapplication reminders, which even allow for more frequent reminders when swimming or sweating. You can set reminders that work for you and your family, based on activity or personal preferences. Customize with choice of sounds. • Sunscreen product profiles and recommendations tailored to each family member. You can even generate a recommendation list for the whole family at once, making shopping simple! • Local UV index and weather forecasts, so preparing for your vacation (or staycation) becomes a breeze. • Sun protection tips from the COPPERTONE® Solar Research Center. • Valuable coupons for your favorite COPPERTONE® products. « ‘Normal’ Barbie -What Barbie Would Look Like If Based On Actual Women! Thank you!!!!! You should try writing your own blog, I had no idea when I started that it would be as fun and rewarding as it is! I’ve found that it can be harder to come up with topics if you make your blog very specific. Which is why my blog covers internal as well as external beauty instead of say just skin care. It amazes me everyday the reach of my blog and it so much fun to know I’m reaching around the world with my writing! If you start a blog make sure to let me know, I’d love to see it!